The first of this month’s products is the Eye Cool Jel from Monu Skin, promising to instantly revive and tone tired eyes, reduce puffiness and dark circles, I’m excited to give this a go in the coming mornings! On first application, the gel seems a bit more on the watery side but certainly refreshing. Let’s hope it can hide those early mornings! Next is the product I’m most excited to try this month – the Nip + Fab Glycolic Scrub Fix. I’m a big fan of the Nip + Fab range and I’m conveniently lacking a good exfoliator right now. This is a 3-in-1 micro exfoliant with glycolic and salicylic acids to refine, brighten and renew. I’ve been struggling with my pores recently so I’ll have fun testing this out and will definitely be reporting back! This was a new find by the people at Glossybox, and works to leave your hair feeling hydrated, free of frizz, tangles and split ends. It’s enriched with baobab oil and is free from any nasties like parabens, sulphates or silicons.. I’m not a big hair mask user but nonetheless, I’m still keen to use this! I really love getting useful minis like makeup removers in my Glossyboxes each month, it makes travelling a lot lighter! Gatineau is a French brand and this eye makeup remover is oil-free (a big win for me) and formulated with cucumber, green tea and aloe vera. It sounds perfect for sensitive eyes! The final product in this month’s Glossybox is the Laritzy Shade Stix in Aloha. A bronzer and cream contour, I’m keen to get this stick into my daily makeup routine. I’m not a big user of cream products but on swatching this it definitely seems creamy and easy to blend. The shade seems perfect for a subtle bronze too! 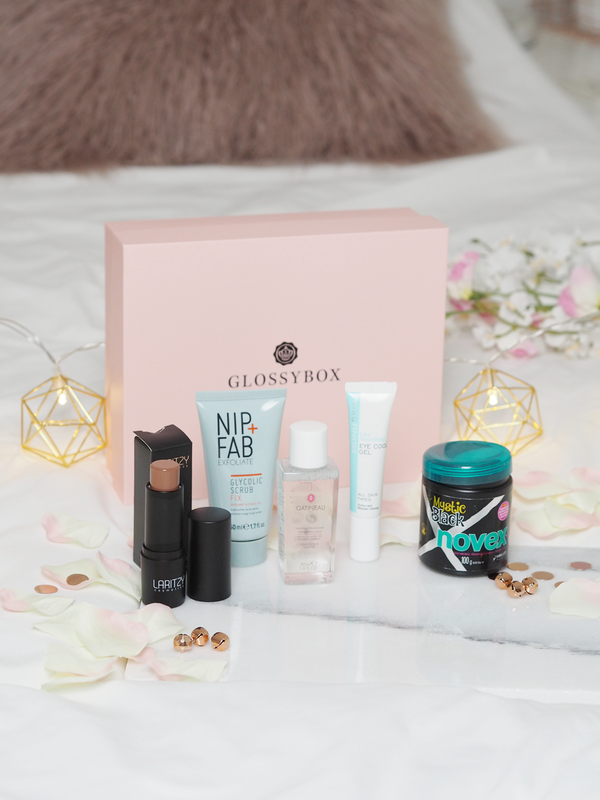 This month was definitely one of the best month’s I’ve received so far, and as per usual if you fancy getting your hands on this month’s box you can subscribe now and use LUCY15 for 15% off your order!